« From Jackson Hole to the Teton Heights? Going the rounds among mainstream economists in the US are new explanations for the slowdown in productivity growth and innovation especially since the beginning of the 21st century and also why labour’s share in national income has been in long-term decline since the early 1980s. In a new paper, The Rise of Market Power and the Macroeconomic Implications, Jan De Loecker and Jan Eeckhout (DE) argue that the markup of price over marginal cost charged by public US firms has been rising steadily since 1960, and in particular after 1980. 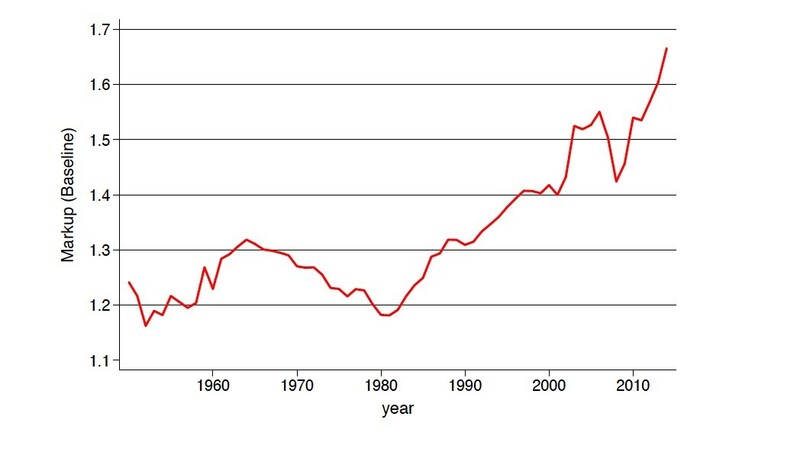 The paper suggests that that the decline of both the labor and capital shares, as well as the decline in low-skilled wages and other economic trends, have been aided by a significant increase in markups and market power – in other words the rise of monopoly capital in the form of ‘super-star’ companies like Apple, Amazon, Google etc that now dominate sales, profits and production and where the utilisation of labour is low compared to other companies and industries. These monopolies won’t invest because they don’t need to compete, and so productivity growth slows. This is a counter-explanation to the current dominant explanations for the perceived decline in labour’s share, namely, globalization (American workers are losing out to their counterparts in places like China and India) and automation (American workers are losing out to robots) and inverse rise in the share going to profits. Now various mainstream economists are arguing that this rise is not due to globalisation or automation but due to higher markups in prices from companies that control their markets monopolistically. In other words, they are making extra profit over and above ‘normal competitive costs’. De Loecker and Eeckhout find that between 1950 and 1980, markups were more or less stable at around 20 percent above ‘marginal cost’, and even slightly decreased from 1960 onward. Since 1980, however, markups have increased significantly: on average, firms charged 67 percent over marginal cost in 2014, compared with 18 percent in 1980. So the enormous increase in profits over the past 35 years, they argue, is consistent with an increase in market power. “In perfect competition, your costs and total sales are identical, because there’s no difference between price and marginal costs. The extent to which these two numbers—the sales-to-wage bill and total-costs-to-wage bill—start differing is going to be immediately indicative of the market power,” says De Loecker. “Most of the action happens within industries, where we see the big guys getting bigger and their markups increase,” De Loecker explains. In another paper, a group of mainstream economists considered a ‘superstar firm’ explanation for the fall in labour share of GDP. The hypothesis is that technology or market conditions—or their interaction—have evolved to increasingly concentrate sales among firms with superior products or higher productivity, thereby enabling the most successful firms to control a larger market share. Because these superstar firms are more profitable, they will have a smaller share of labour income in total sales or value-added. Consequently, the aggregate share of labour falls as the weight of superstar firms in the economy grows. They found that the concentration of sales (and of employment) has indeed risen from 1982 to 2012 in each of the six major sectors covered by the US economic census. And those industries where concentration rises the most have seen the sharpest falls in the labour share, so that the fall in the labour share is mainly due to a reallocation of labour toward firms with lower (and declining) labour shares, rather than due to declining labour shares within most firms. It’s certainly true that accumulation of capital will take the form of increased concentration and centralisation of capital over time. Monopolistic tendencies are inherent, as Marx argued in Volume One of Capital 150 years ago. And Marx’s prediction of increased concentration and centralisation of capital as a long-term law of capitalist development finds further confirmation in a new study of US publicly quoted companies. Kathleen Kahle and Rene Stulz find that slightly more than 100 firms earned about half of the total profit made by US public firms in 1975. By 2015, just 30 did. Now the top 100 firms have 84% of all earnings of these companies, 78% of all cash reserves and 66% of all assets. The top 200 companies by earnings raked in more than all listed firms, combined! Indeed, the aggregate earnings of the 3,500 or so other listed companies is negative – so much for most US companies being awash with profits and cash. Why is this happening? According to this study, it is the drive for new technology to lower costs, as Marx argued before. Research and development has become increasingly critical to competitiveness. The bigger and richer the market Goliaths get, the harder it is for the Davids of the US economy—and the need for R&D to compete. Companies drowning in cash can easily afford patents and the investments to develop those. Or, as seems to be happening, to buy the company with the patent. However, there are two things against the ‘market power’ argument, at least as the sole or main explanation of the rise in profits share and profit per unit of production. First, as De Loecker and Eeckhout find, economy-wide, it is mainly smaller firms that have the higher markups – hardly an indicator of monopoly power. And second, labour share did not really fall very much until after 2000 to reach a low in 2014. Indeed, in 2001 it was at 64%, the same share as in 1951 – although it is true that it had fallen to the low 60%s in the 1980s and 1990s. But by 2014, labour share in GDP was as low as 60%. And it’s the same with profits per unit of US national output or corporate value-added. Profits per unit of gross value added (a measure of new output) in US non-financial companies rose from just 2% in the 1970s to 4-6% in the 1990s. Bu the real take-off was again from 2000, with profit per unit rising to a peak of near 14% by 2014. Was the basis of this recent leap in profit share and sharp fall in labour share a product of globalisation, or automation or monopoly power, or is there another explanation? Well, one mainstream economist, Mordecai Kurz of Stanford University in another paper, On the Formation of Capital and Wealth, has measured what he calls ‘surplus wealth’ being accumulated by large firms. This he defines as the difference between wealth created (equity and debt) in the form of financial assets and a firms’ actual real fixed assets. This is equivalent to Tobin’s Q measure of the stock market price relative to the real value of corporate capital. In a Marxist sense, it is really a measure of company’s fictitious capital or profit. Kurz finds that aggregate ‘surplus wealth’ rose from -$0.59 Trillion in 1974 to $24 Trillion which is 79% of total market value in 2015. The added wealth was created mostly in sectors transformed by IT. Declining or slow-growing firms with broadly distributed ownership have been replaced by IT based firms with highly concentrated ownership. Rising fraction of capital has been financed by debt, reaching 78% in 2015. Kurz reckons this has been made possible by IT innovations that enable and accelerate the erection of barriers to entry and once erected, IT facilitates maintenance of restraints on competition. These innovations also explain rising size of firms. Measuring monopoly power from this ‘surplus wealth’, Kurz reckons it rose from zero in the early 1980s to 23% in 2015. Now Kurz and the other mainstream papers may well be right that, in the neo-liberal era, monopoly power of the new technology megalith companies drove up profit margins or markups. The neo-liberal era saw a driving down of labour’s share through the ending of trade union power, deregulation and privatisation. Also, labour’s share was held down by increased automation (and manufacturing employment plummeted) and by globalisation as industry and jobs shifted to so-called emerging economies with cheap labour. And the rise of new technology companies that could dominate their markets and drive out competitors, increasing concentration of capital, is undoubtedly another factor. But another compelling explanation is that the rise in corporate profits was increasingly fictitious, based on rising stock and bond market prices and low interest rates. The rise of fictitious capital and profits seems to be the key factor after the end of dot.com boom and bust in 2000. Thereafter, profits came increasingly from finance and property, not technology. If that is right, then it helps to explain why the biggest slowdown in productivity growth in the US began after 2000, as investment in productive sectors and activity dropped off. And if that is right, then the recent fall back in profit share and modest rise in labour share since 2014, suggests that it is a fall in the overall profitability of US capital that is driving things rather than any change in monopoly ‘market power’. But that is something mainstream economics never wants to consider. If profits are high, then it’s ‘monopoly power’ that does it, not the increased exploitation of labour in the capitalist mode of production. And it’s monopoly power that is keeping investment growth low, not low overall profitability. This entry was posted on September 5, 2017 at 12:07 pm and is filed under capitalism, economics, marxism, Profitability. You can follow any responses to this entry through the RSS 2.0 feed. You can leave a response, or trackback from your own site. This is trend which you have highlighted is an important one for contemporary bourgeois thought desperately grappling with the issue of low productivity. It is the kind of issue we should be discussing later in London rather than some of the archaic headings. If we assume that over the course of the business cycle Tv = Tp where Tv stands for Total value and Tp for Total prices, we may further assume that Tp comprises tc+tv+ts where tc equals the consumption of constant capital including depreciation, tv equals the total expenditure of variable capital and ts is total surplus value produced. Net value is tc+tv and gross value or total prices are tc+tv+ts. Now the studies take gross value as their starting point which is important because this includes depreciation. I have examined and pointed readers to the changes in depreciation that has occurred since the advent of the “knowledge age” which was one of the technical underpinnings of globalisation. The knowledge age is synonymous with the ascendancy of I.P. which now includes R&D. Since then there has been a double counting of depreciation. Firstly, the seller of a product which includes a large IP element is allowed to depreciate that element as it is a “wasting asset” or time limited asset even when protected by patent. However, in sum they are repaid this element not through depreciation but the sum of the selling prices generated by this product. In turn, the buyer whose purchase price includes the IP element depreciates that I.P. as part of the overall and undifferentiated depreciation of that product. Now Marx was clear, depreciation is always an average for the industry, but these new industries have set their own average which is higher than the low tech industries because the asset, IP, is higher in the high tech industries. These high-tech industries are thus treating their expenditure on IP as both a cost and as a wasting asset. As far as the pricing mechanism goes this represents no problem to them because of their monopoly pricing power, but it does represent a redistribution of value form lower tech companies, service companies and consumers. Secondly on to margins. Inflated depreciation increases both cost price and selling price proportionately leaving margins unaffected. That is why the authors report a lower increase in margins in the monopolies, because essentially cost prices have been inflated. A margin in the traditional sense is the surplus money that arises when cost price is deducted from selling price. But margin is not to be confused with cash flow. Inflated depreciation increases both cost price and cash flow, a real sleight of hands which does not increase overall taxation either because of its effect on cost price (a double benefit to these corporations). Depreciation measured against net value added (national income) has soared. In many industries, it is now a bigger component of corporate cash flow than profits themselves, particularly post-tax profits. That is why I have written so extensively about inflated depreciation and its effect on cash flow and why I have drawn attention to the rate of cash flow (depreciation + profit divided by total capital) as a dynamic marker for the capitalist economy. Two other observations flow from inflated depreciation. As net investment is the result of gross investment less depreciation it follows that some of the fall in net investment is a statistical mirage because depreciation is inflated. Secondly, productivity measures are themselves affected by inflated depreciation because it is measured over gross value added per hour and not net value added. And if gross value has been inflated by depreciation it means that productivity is actually worse than reported. what is the relationship between your long-held thesis that the rate of profit in declining in the present era, and the graph in your latest post of “profit per unit of real gross value” “rising from 2% to a peak of 14% by 2014”? Profit per unit of value or GDP when multiplied by total value or GDPp gives you total profit. So it is really a measure of the mass of profit not the (Marxian) rate of profit, which effectively is measured as total profit against capital advanced (the stock of fixed assets, inventories and variable capital (wages). So you can have a rising profit per unit or mass of profit and a falling rate of profit – indeed that is often (even usually) the case. It seems to me that Baran & Sweezy explanation (the authors of the “new” paper should have note where their inspiration was coming from) and the inflated Finance Capital profits are not contradictory, but complimentary. Yes, you can, but in that case, we should be able to see the increased advance in capital. One of your contentions, Michael, is precisely that there has not been, or has not been adequate, advances in capital– “adequate investment,” which seems to run counter to Marx’s analysis of the tendency of the rate of profit to decline with the advance in capital. 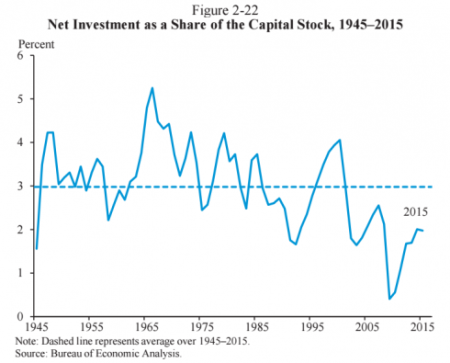 You use the chart “net investment as a share of capital stock” to bolster that assertion. So I think you have more work to do to explain this. What I think is interesting about that chart is that the ratio never falls into negative territory– below zero– after 1945, even during the Great Recession of 2008-9, as it did throughout the period of the Great Depression, so much so that the valuation of the accumulated capital at the end of that period was significantly below that at the beginning of the period. That’s the original nonsensical analysis that traces its roots all the way back to Ricardo, and the inability of “equal exchange” to account for surplus value, surplus labor-time. So, shouldn’t the variable capital be subtracted by the amount of debt during a given rotation time? 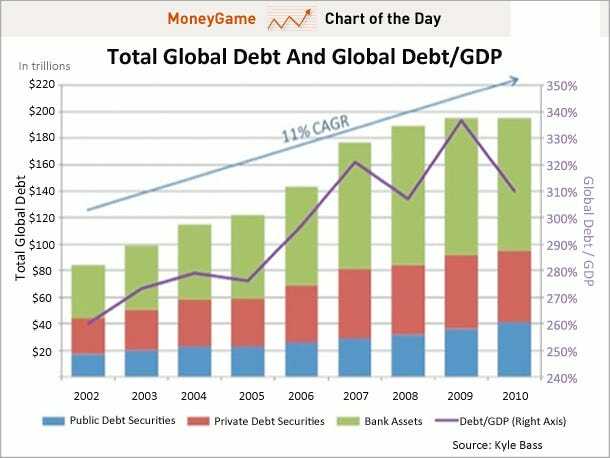 I mean, increasing debt means profit was not realized, if you sum the total amount of value realized. How can costs and sales be identical? Where does profit come from? I realize the economists (mainstream) refuse to recognize surplus value, but have they just given up on the concept of profit = sales – cost?